Charles Krafft & Mike Leavitt’s ‘Pitchfork Pals’ bombard London with the best of Seattle’s post-grunge visual art culture. 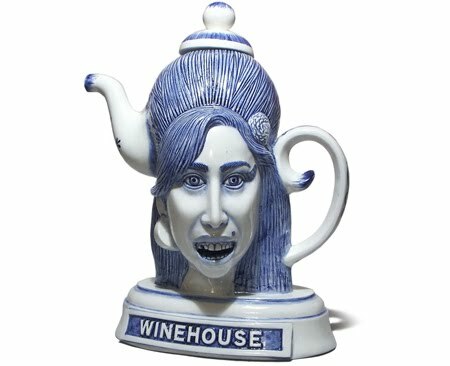 A variety of handcrafted items transform StolenSpace Gallery into a sinister souvenir shop with dictator teapots, life-size human bone china shovels, cardboard tennis shoes and artist action figures. A sampling of individual projects frames the debut of this dynamic duo’s ‘Pitchfork Pals’ ceramic collaborations. ‘Pitchfork Pals’ spawn from an ongoing dialogue between two artists separated by 30 years of age who share a mission for art alternatives. Since 2005 the two Seattle natives have formed a series of media icons, politicians and celebrities such as Kim Jong Il, Mahmoud Ahmadinejad, Aleister Crowley, Nick Griffin and Amy Winehouse. Leavitt sculpts these busts 20 to 30 cm tall, then each edition is slip-cast and hand-painted by Krafft in his basement. Some become classic busts, teapots or the British “Toby mug” knick-knack. Taking pride in their handiwork, these two iconoclastic craftsmen are not armchair critics. The artists’ politics range widely, so their meditation on manufactured evil is not easily digestible. Looking into the deeply carved pupils of a ‘Pitchfork Pal’ conjures biographical depths underneath easy editorializing. Totemic power and sculptural nuance make these tainted characters undeniably mesmerising. The show opens this evening with a private view, Thursday 14 May and will run at the gallery until the 30 May 2010.